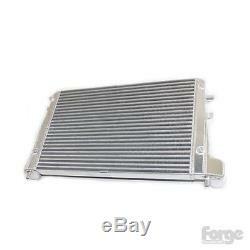 Forge revalued inter cooler for seat leon cupra 2.0 tfsi. This product sheet is originally written in English. Please find below an automatic translation into French. If you have questions please contact us. Forge uprated intercooler for seat leon cupra 2.0 tfsi. This uprated exchanger replaces the original front mounted exchanger. It can be used alone or in combination with our "twintercooler" kit. The intercooler uses a 650x400x50mm bar and the baseplate to full effect. We performed tests on standard vehicles and those running larger turbos at 400hp. On the standard car the intercooler reaches + 10hp, + 29 ft / lbs and a reduction in input temperature of over 20 ° c.
If this really comes in its own, on the listening engines, where the gains are even more impressive. The inlet and outlet tubes are 63mm, which means our twintercooler pipes fits, with the bayonet coupler removed or to install them without our twintercooler kit, we include our fmkt010 silicone hoses for easy installation. Audi- a3 1.8 tfsi / a3 2.0 fsit / s3 2.0 fsit (chassis 8p) / tt mk2 2.0 / tts mk2 seat cupra 2.0 tfsi skoda-octavia 2.0 fsit volkswagen- eos / golf mk5 gti / golf mk5 ed30 / golf mk5 diesel / golf gti mk6 / golf mk6 r / golf mk6 ed35 / scirocco 2.0 / scirocco r Please note: Before purchase, please contact us about availability as some exchangers can carry a 4 to 6 weeks order lead time. Forge motorsport was founded in 1994 with the simple ideals of manufacturing according to the standards of quality, innovation and intelligent design. Their mantra is the best customer service and service in the world. In doing so, they have developed the widest range of replacement replacement parts blow / recirculation valves, intercoolers and actuators in the world. We try to reply to messages within 24 hours. If you do not receive an answer within 24 hours please send us another message. We post worldwide, so please contact us if you need a quote. To pay an international order, please purchase the item and we will adjust the charges before payment. Please be aware that some of our items are made to order and can carry up to 14 days. Information on the deadlines for all made to order items will appear in the product description. Our goal is to deliver stored items in 3-5 business days depending on the time of order and the availability of our suppliers. If you are still waiting for your product after 10 working days, please contact us so that we can follow your item. Upon receipt of your order, you will be asked to sign for the goods received in good condition. If the package does not seem to be in good condition, then please refuse the delivery. If you can not activate the content at the time of delivery please sign for the parcel as "deactivated". Failure to do so may affect any warranty claim you make thereafter. If you wish to return your item please check that you are in the return period and contact us to arrange a return and refund. All items must be inspected upon return and a full refund will be issued only if the item is in satisfactory condition. We will be unable to offer a refund for the damaged goods. The item "forge recalibrated intercooler for seat leon cupra 2.0 tfsi" is on sale since Sunday, March 25, 2018. It is in the category "do-it-yourself \ plumbing, sanitary \ plumbing, faucet". The seller is "wg_motorparts" and is located in rochester.